Do you know what to do when you encounter emergency responders on the road? Many drivers don’t know what to do when emergency vehicles approach or when they encounter emergency scenes or traffic stops. Thousands of emergency services personnel have been killed or injured while attending to emergencies on the road. Every day there are countless near misses. Police officers, firefighters, paramedics, sheriffs, peace officers and tow truck drivers working at roadside emergency scenes have dangerous jobs but the risks can be minimized. 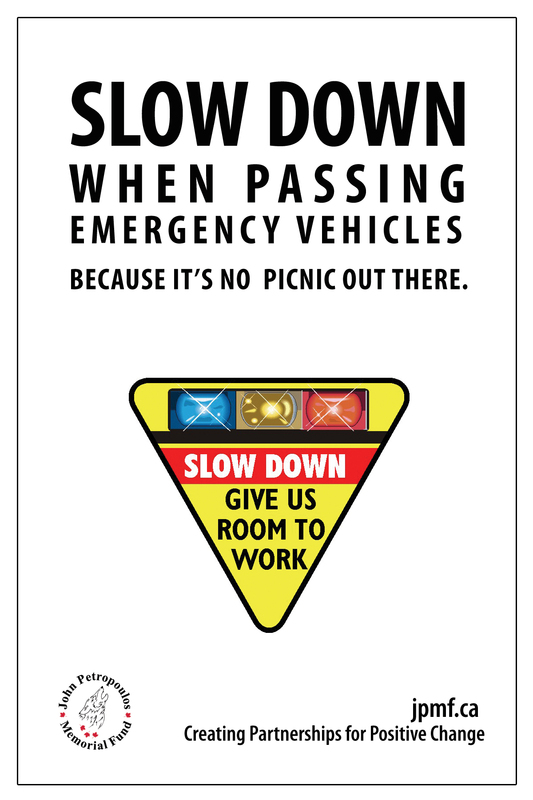 SLOW DOWN or MOVE OVER when passing emergency services vehicles working on the road. Give them room to work. Reduce your speed when passing, in the adjacent lane, emergency vehicles or tow trucks stopped with their lights flashing. Failure to slow down may result in speed fines being doubled. Check the legislation in your province or state for details on what rate of speed the law requires you to slow down to when passing emergency scenes. Move over to give emergency workers room to work. On highways and other roads with multiple lanes, drivers should move into the lane furthest away from the emergency scene if it can be done safely. Be sure to shoulder check before safely changing lanes. Motorists should remain alert and cautious for the safety of all involved. Drivers should remember their responsibility to operate a vehicle safely and resist the urge to stop and stare, causing further hazard. On streets that have traffic flowing in both directions and lanes divided by a yellow line, motorists should pull over to the right curb and stop. On one-way streets or roads divided by a median, drivers should move left or right to the nearest curb. If you’re stopped at an intersection, look to see where the emergency vehicle is approaching from. If the vehicle is behind you, safely pull to the right. If the emergency vehicle is approaching from the front or side streets, remain stopped until it passes. If you’re approaching an intersection, safely pull to the right and stop before entering the intersection. Do not stop in the middle of the intersection. Once out of the way, then stop until the emergency vehicle has passed and check that no other emergency vehicles are approaching. Remember that emergency vehicles always have the right of way. Do not follow within 150 metres of any emergency vehicle that has its siren or lights operating. Check your rearview mirror regularly. Avoid distractions: cell phones, stereo, applying makeup while driving, eating while driving, etc.